It seems like we've been waiting for a consumer version of the Oculus Rift for an absolute eternity now, but new tidbits this week provided a tantalizing glimpse at what we can expect from the VR headset when it does eventually launch, in terms of hardware, software, and price. Let's touch on price first, since there's no chance of the masses embracing VR if VR headsets cost an arm and a leg. Speaking to Eurogamer, Oculus VR CEO Palmer Luckey revealed that the final retail price for the consumer version of the Rift will be between $200 and $400. "That could slide in either direction depending on scale, pre-orders, the components we end up using, business negotiations…" he said. "Whatever it is, it's going to be as cheap as possible." There's good reason to believe Luckey. Oculus' $350 second-generation developer kit (DK2) provided a mammoth jump in quality, performance, and features (positional tracking, yay!) over the original $300 Rift (DK1). And in a recent interview with Ars Technica, Oculus CEO Brendan Iribe said that Mark Zuckerberg, CEO of Facebook (Oculus' new parent company), wants to sell the consumer version of the VR headset as close to cost as possible to help spur adoption of the radical new hardware. PCWorld senior writer Brad Chacos using an older Rift prototype at E3 2013. 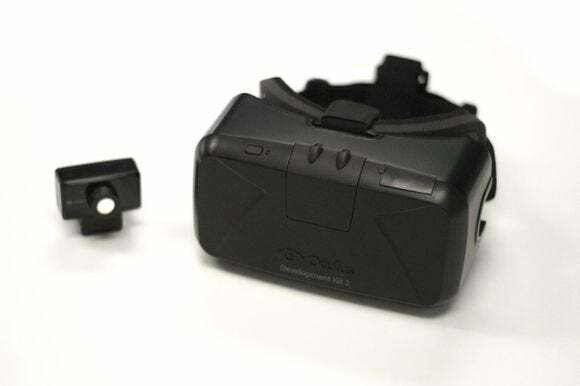 As far as the hardware in the consumer version of the Oculus Rift goes, Palmer played coy with hard spec details, but he told Eurogamer that "the consumer version is significantly improved. The jump from DK1 to DK2 is similar to the jump from DK2 to [the consumer version]." 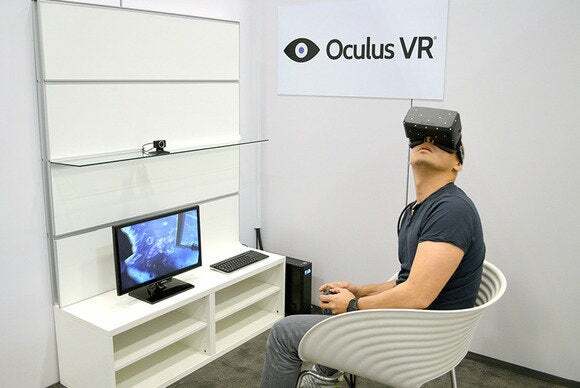 The resolution will be significantly improved from the 1080p found in the DK2, Luckey promises, and the refresh rate will jump from 75MHz to 90MHz or more, which should help reduce eye strain and provide smoother visuals. The hardware specifications for the consumer version of the Oculus Rift have already been nailed down, in fact. But hardware is only as good as the software that runs on it. Oculus has been burning money to build a PC gaming dream team and third-party developers have been creating all sorts of wondrous non-gaming uses for the Rift, but actually using the headset is a bit of a burden. Trying to navigate the Windows desktop to find the launcher for your VR application is an exercise in frustration with the Rift strapped to your face; it's far easier to remove the headset, navigate Windows normally on your display, and slap the Rift back on once you've started the program you're looking for. That ain't going to cut it for folks looking for a truly immersive VR experience. 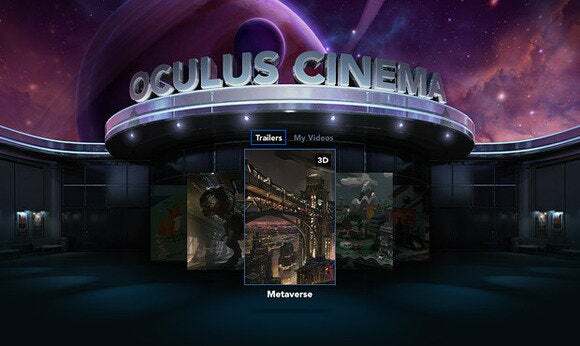 Oculus Cinema running on the Gear VR. Enter the Gear VR. Samsung's Galaxy Note 4-powered virtual reality headset runs software designed and powered by Oculus, and it foreshadows the type of interface and applications we're likely to see in the consumer version of the Rift. Samsung's headset will ship with four Oculus-designed software experiences to help you seamlessly navigate virtual reality: Oculus Cinema, Oculus 360 Videos, Oculus 360 Photos, and Oculus Home. Oculus Home is a digital storefront for virtual reality content, while Oculus 360 Photos and Videos "are experiences that allow you to playback panoramic content in VR." Oculus Cinema, meanwhile, is a full-blown virtual movie theater, similar to the one that blew my mind at E3 2013. It's easy to imagine all four apps being included in the consumer version of the Oculus Rift. In fact, I'd be downright shocked if they weren't. (It'd be a crime not to have Oculus Cinema out-of-the-box!) Other developers are already toying with VR interfaces as well; witness Netflix's Oculix prototype. 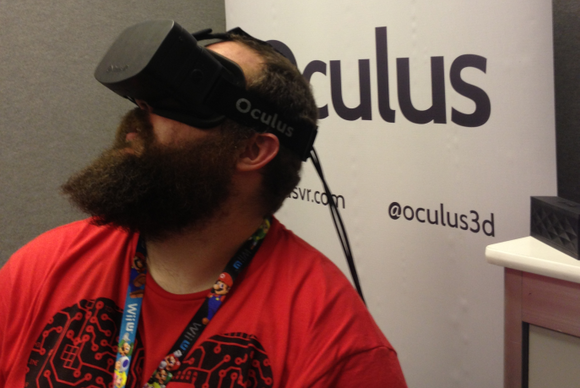 So the hardware's all designed and Oculus software will be shipping in the Gear VR before the end of the year. That means the consumer launch of the Oculus Rift is right around the corner, right? Not so fast. "At launch we don't just want to have a token five, six or seven launch titles like a lot of consoles," Luckey told Eurogamer. "You have to have a lot of stuff coming out the door at launch. So I guess to those people who are waiting: keep waiting and it will be worth the wait." Sorry—though a delay to get more games out the door makes sense. Most people have never experienced virtual reality, after all, and you only have one chance to make a good first impression. On the plus side, Oculus has said it wants to ship the Rift before the end of 2015, and amazing-looking games like CCP's Eve Valkyrie, Superhot, Elite Dangerous, and the upcoming Alien: Isolation are already dabbling heavily in VR. In the meantime, if you're one of the lucky few in possession of an Oculus Rift Developer's Kit, check out the 41 best Oculus Rift games, demos, and experiences while you wait for the consumer version to drop.